Spying returns in Total War: Three Kingdoms, but with an entirely new system governing it. Whereas in most previous Total Wars, spies were a dedicated class of Agent (a campaign hero), in Three Kingdoms they are recruited from among the ranks of your regular characters. Characters have personality traits, likes and dislikes, friendships and rivalries, and these can all affect their satisfaction with their place in the world, both in relation to your faction and your enemies. Under the right conditions, a character may become “willing” to spy on an enemy for you – at which point you can instruct them to do so. Their usefulness will depend on their seniority in the enemy faction. Initial benefits are limited to getting line of sight on enemy cities, but escalate to various acts of sabotage and assassination – such as poisoning supplies – as that character develops and rises through the ranks. Long-established spies can even build up “an undercover network” by reaching out to “the shady people” in a rival faction, granting further opportunities. This has particular implications for multiplayer. “If we play a multiplayer campaign, I might tell you your faction leader is actually a spy of mine,” Walter says, with gleeful malice. Spy actions have a monetary cost associated with their difficulty, but because Creative Assembly doesn’t want to introduce too much RNG to the system, spy actions will always succeed. The risk comes with the chance of discovery. This varies according to several modifiers, such as a spy’s ability, and that of the targeted faction’s defensive network. If a spy is uncovered, executing them is naturally an option, but you can also choose to turn them, and send them back at their former employer as a double agent. 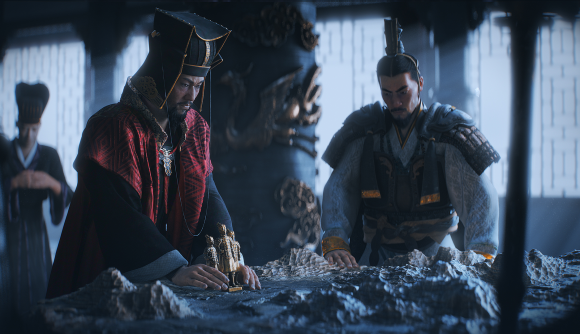 Total War: Three Kingdoms releases in spring next year – hit that link for everything we know about it so far, or click here to read our hands-on preview of an ambush battle. It’s all shaping up pretty nicely, in my opinion, but Creative Assembly are still keeping the most exciting stuff under wraps. I’ve enjoyed what we’ve seen so far (and it certainly looks pretty), but we really need a closer look at this espionage stuff.